This is the long-distance equivalent of taking someone out for a few drinks and salty treats. 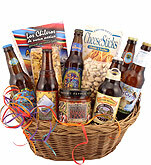 Maybe you aren't available for that personal experience, but the microbrew party basket will ensure that your loved one feels your presence regardless. Each basket includes four different microbrew labels, so variety is the theme of this party. From Father's Day to an anniversary or a milestone birthday, there's no better way to celebrate. Gave a BeerGifts party basket to our son last year and he loved it. Decided to send one this Christmas. As he enjoyed it so much last time, he promptly opened it and has now consumed half of the contents (before Christmas). PS He's 49 years old; couldn't help it! This was a gift for a friend and they abosolutely lived it. There was salsa in the basket it was so good he found it on amazon to buy more. So the products in the basket were all GREAT! I bought this basket for my son in lawâ€™s birthday and he loved it. It arrived on time and was exactly as described. I will definitely order from this company again . I got this as a gift for a buddy of mine who is a beer enthusiast and he really enjoyed the brews and snacks! I recommend this to anyone who likes beer! My son turned 31 and he is a beer drinker.